What a year! It’s hard to believe this is our fourth year of blogging and our fourth annual best restaurant list. This year was extra special, as we spent a month eating heavily in our favorite city in the world, Copenhagen. Not only that, we went to Noma, Eleven Madison Park, and Osteria Francescana this year. Which of them made our ultimate list for 2018? Read on to find out! I’m not going to speak for Yvonne, but to me, Noma is so far above any other restaurant we’ve ever been to, it’s almost disrespectful to have them on a list. If you’re on the fence, trust us: Noma is worth a trip around the world, especially during vegetable season. Bardo is the best restaurant in Charlotte. Hands down. Chef Mike Knoll of Bardo worked with Chef Jacob Bickelhaupt in Chicago. Bickelhaupt had a two Michelin Star restaurant in Chicago, 42 Grams, which shut down because of a domestic violence incident with his ex-wife. 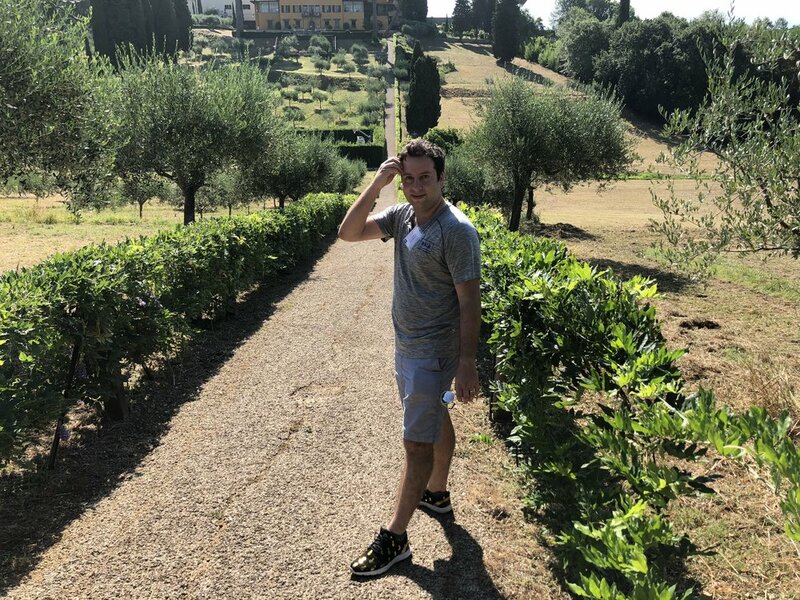 He is holding pop-up dinners around the country, and he held a one day pop-up in Charlotte where he and Chef Knoll served a 12-course tasting menu that was incredible. Atelier Crenn is chronically underrated by the Top 50 Best Restaurants list, but not by Scallionpancake. Of all of our out-of-town high-end dining experiences, this was second only to Noma for 2018. And this dessert? The best. 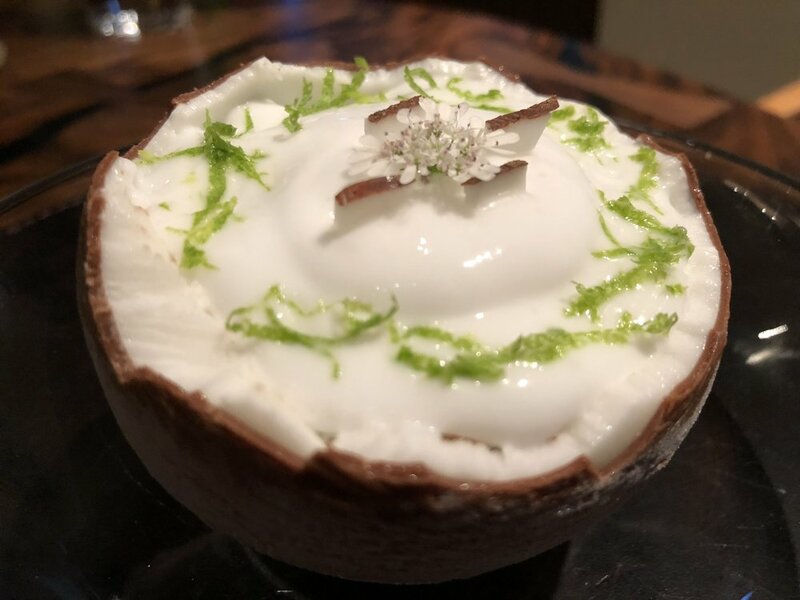 Coconut and pineapple custard with a chocolate outside that is made to look like a coconut. 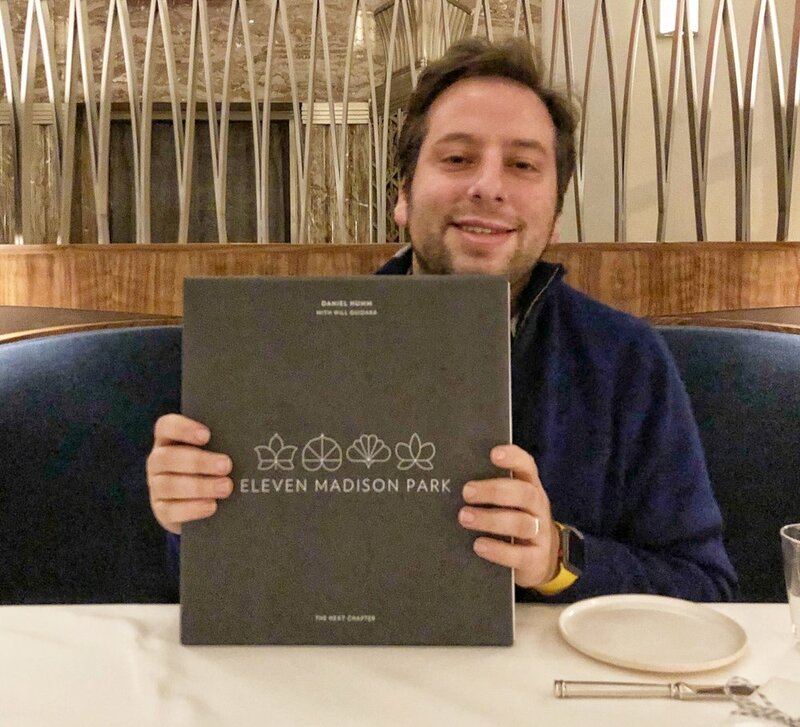 Eleven Madison Park was very contentious in the Scallionpancake household. It didn’t live up to our expectations, but it was still, in my opinion, a spectacular evening. The best dish was the duck, but the rest of the courses were also excellent. The only part I found truly lacking were the dessert courses. This meal at Kuu was one of those that stands out when taking into account the perspective of the time and place. 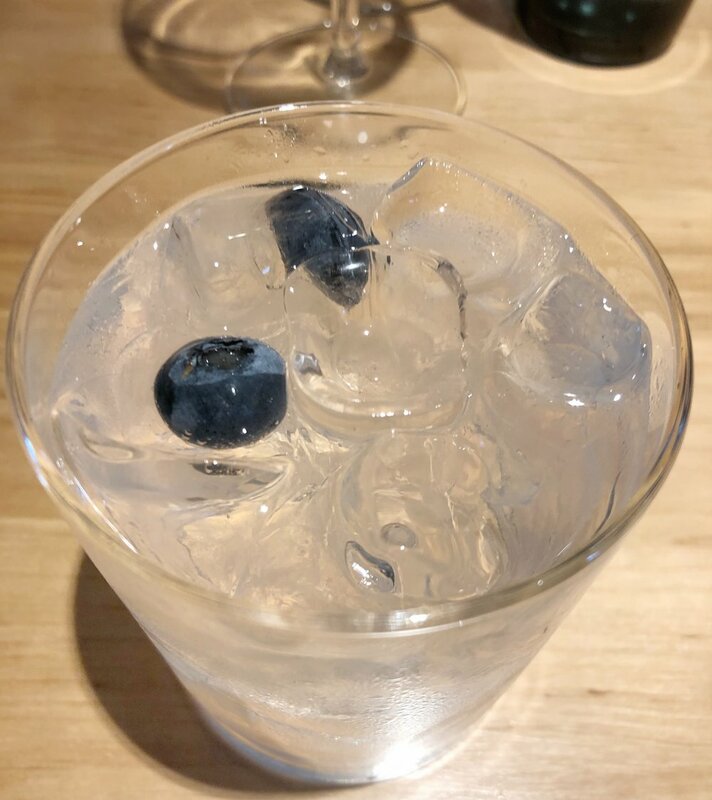 Here, I had reindeer for the first time with a glass of Finnish blueberry vodka. To me, this meal encapsulated our weekend in Helsinki perfectly. This isn’t even a fair fight. Noma was not just a restaurant for me, it was a major life event. 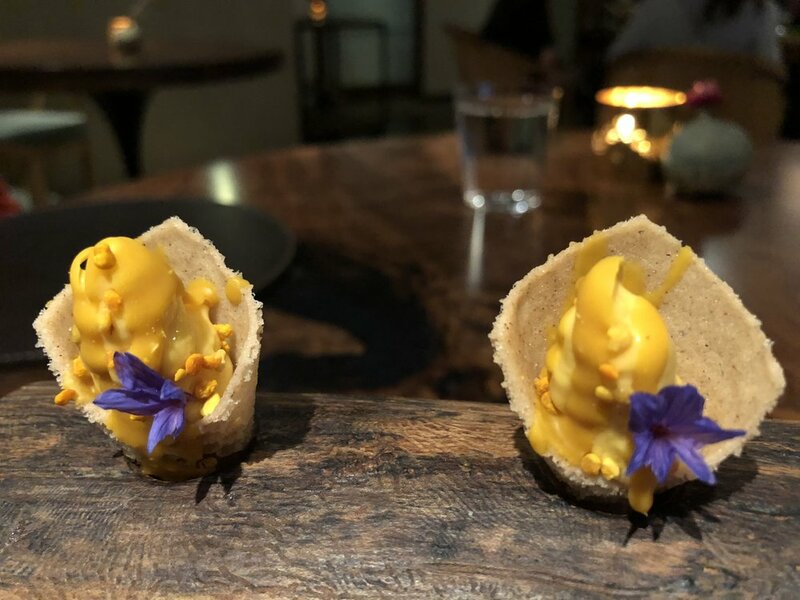 As we’ve mentioned often on the blog and podcast, I often go into experiences with little to no expectations in order to avoid disappointment, and Noma was no exception. I really wasn’t prepared for how much Noma’s atmosphere, service, food, and creativity would blow me away. 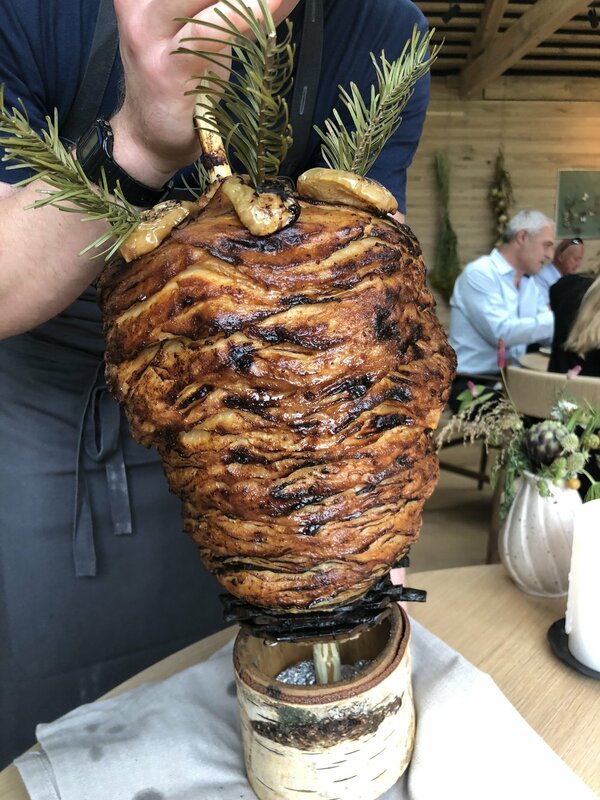 From being greeted at the door by René Redzepi to the celeriac shawarma, to the hygge room, I am not sure if any other dining experience will ever live up to Noma. Everyone knows how I feel about Dominique Crenn and Atelier Crenn, and Jason and I cried tears of joy for her when she finally achieved her third Michelin Star earlier this month. Atelier Crenn’s tasting menu with the accompanying poetic flare was so thoughtful, and every single flavor and texture just made my heart sing. Something about her food really speaks to my soul and my tastebuds, particularly her desserts. So many similar restaurants dial in the dessert options, but Crenn didn’t make them an afterthought. I know that this choice will shock and intrigue Jason (no--we don’t talk about our picks together at all. We don’t want any undue influence on one another). 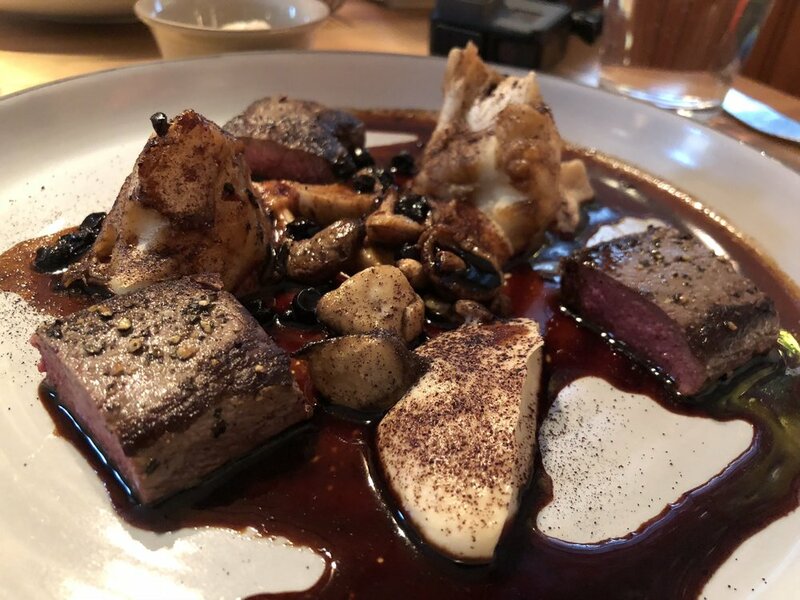 We ate a much larger meal at Amass last year, but somehow it didn’t leave the same impression as the small, non-tasting meal we had at Amass this summer. I had been dreaming of their fermented potato bread since the last time we had it, and it remains one of my favorite things of life. Imagine the best sourdough you’ve ever eaten, but even tangier and doughier. This visit, we dined at the bar, sipped on the best Aperol Spritz I’ve ever tasted, and just had the loveliest time. 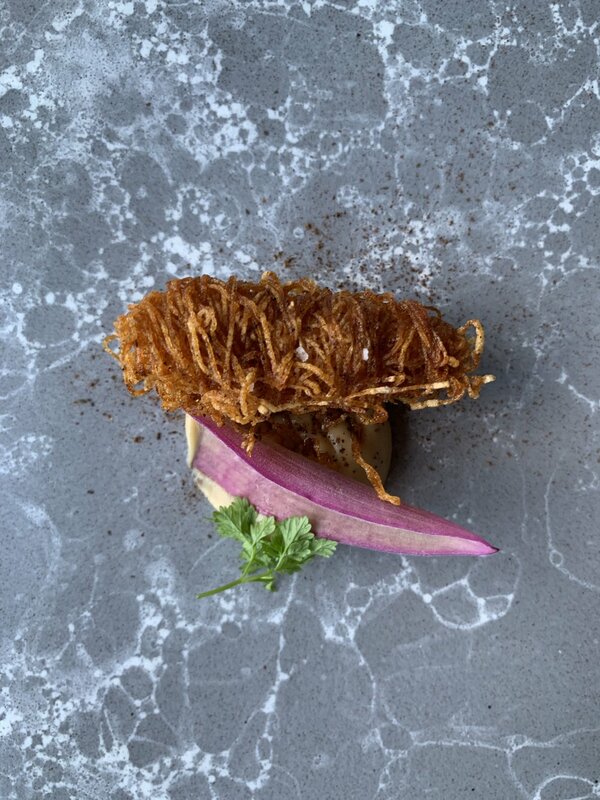 If you are visiting Copenhagen, I recommend ordering sitting at the bar and ordering a la carte over the tasting menu for sure. You do have to sit at the bar or counter for this option, though, and seats are first come, first served. The atmosphere is second to none, also. Amass is housed in a giant warehouse overlooking the water, and the giant murals are majorly fun and change regularly. 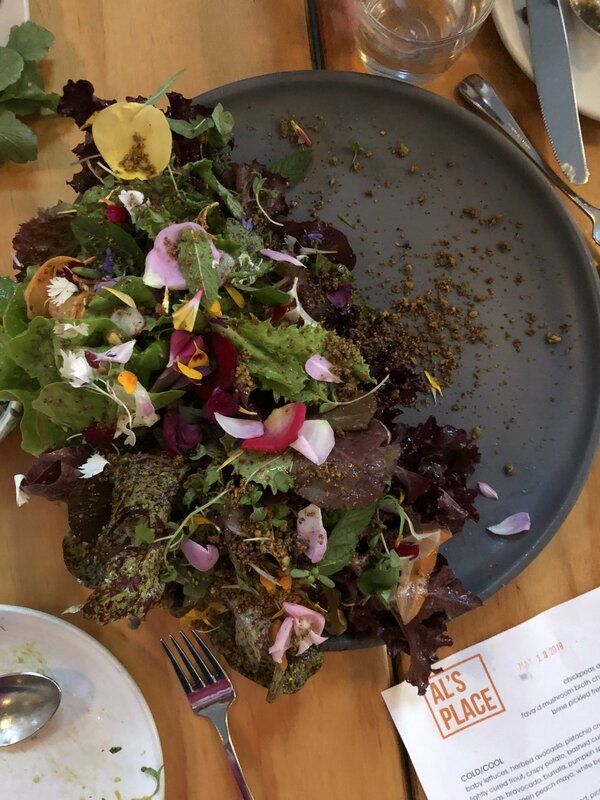 You eat this salad WITH YOUR HANDS. I know there’s a fork there. That’s irrelevant. We went to Al’s Place with our friends (and friends of the blog and pod) Sharon and Andrew when we visited San Francisco in May. Everything about our evening was magical, from the company to the salad you eat with your hands. I loved the emphasis of fresh vegetables with zero compromise on flavor. Also, these radishes with butter made one of the prettiest plates I’d ever seen. From the brine-pickled french fries to the warm brownie sundae, I was in heaven for the entirety of this meal. David Chang is the god of umami, and I love everything I’ve eaten at all of his restaurants, and all of his dishes are highly memorable for me. 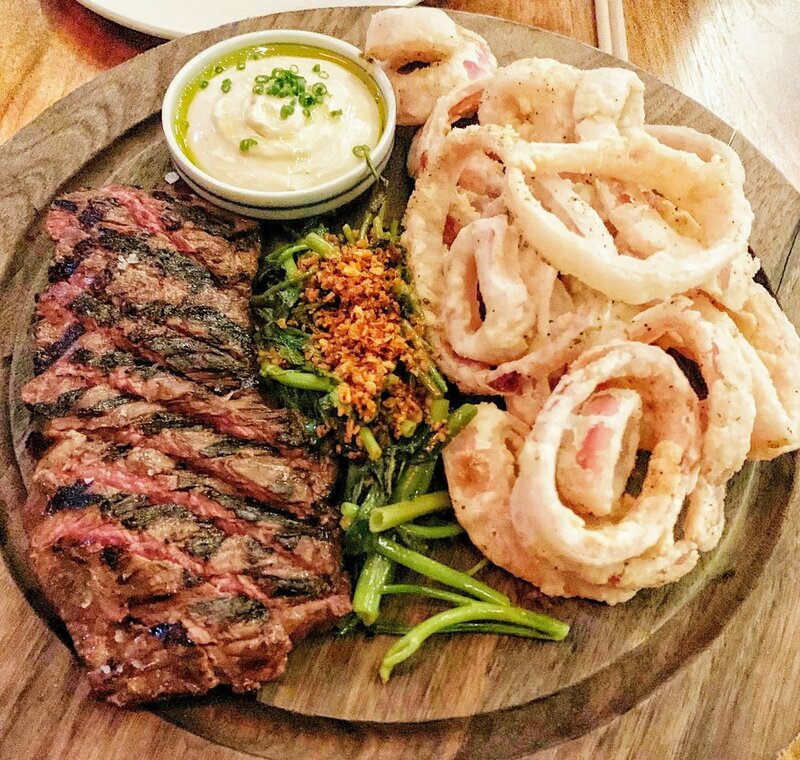 Majordomo was up there with Ko as far as the all around experience, and the bing bread and pickled onion rings with French onion dip skyrocketed Majordomo into my top five late in the year. We also met two fabulous ladies out on a girls’ night, and sitting next to them and getting to know them just made the evening that much more enjoyable. Chang is masterful at creating fine dining experiences that are the polar opposite of stuffy, and I always feel free and giddy while eating at his restaurants. I am not surprised we met new friends at Majordomo, because that’s just the vibe that Chang has cultivated in this space. Bardo is our favorite restaurant in Charlotte, and every experience there transports us and makes us feel that we’ve left home for a bit. 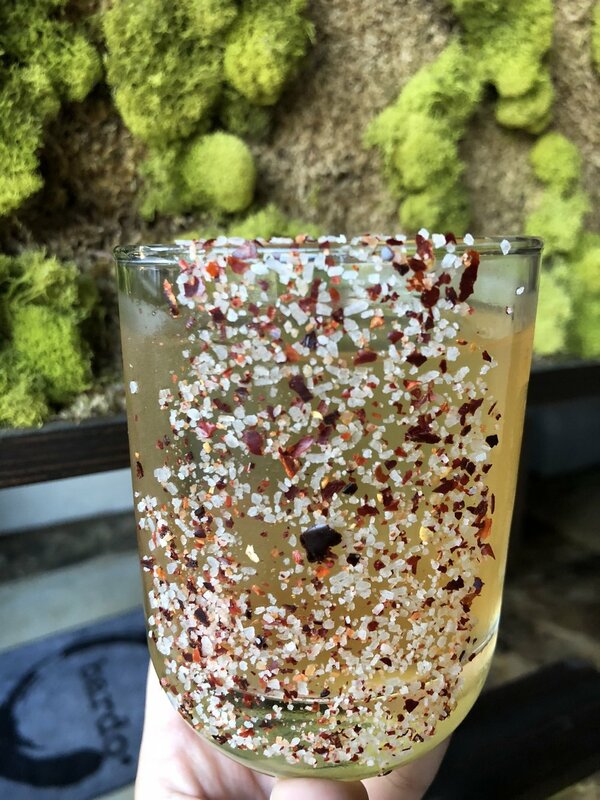 Beyond the inventive and delicious food and drink, Jason Whiteside, Mike Noll, and Amanda Britton have made us feel like a part of their family, and now each visit is even more special than the last. Bardo makes Jason feel happy and relaxed, and since he works so hard and is always so busy, I am so appreciative that we have a food oasis in Bardo that is transformative for my husband during a hectic workweek.